This research investigates the efficacy of business ethics intervention, tests a theoretical model that the love of money is directly or indirectly related to propensity to engage in unethical behavior (PUB), and treats college major (business vs. psychology) and gender (male vs. female) as moderators in multi-group analyses. 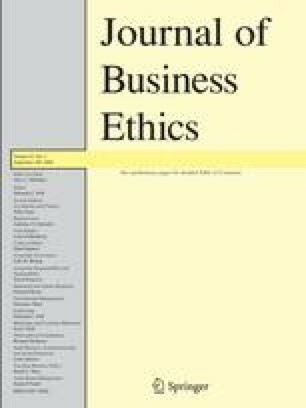 Results suggested that business students who received business ethics intervention significantly changed their conceptions of unethical behavior and reduced their propensity to engage in theft; while psychology students without intervention had no such changes. Therefore, ethics training had some impacts on business students’ learning and education (intelligence). For our theoretical model, results of the whole sample (N = 298) revealed that Machiavellianism (measured at Time 1) was a mediator of the relationship between the love of money (measured at Time 1) and unethical behavior (measured at Time 2) (the Love of Money → Machiavellianism → Unethical Behavior). Further, this mediating effect existed for business students (n = 198) but not for psychology students (n = 100), for male students (n = 165) but not for female students (n = 133), and for male business students (n = 128) but not for female business students (n = 70). Moreover, when examined alone, the direct effect (the Love of Money → Unethical Behavior) existed for business students but not for psychology students. We concluded that a short business ethics intervention may have no impact on the issue of virtue (wisdom). Thomas Li-Ping Tang (Ph.D., Case Western Reserve University) is a Full Professor of Management in the Department of Management and Marketing, Jennings A. Jones College of Business at Middle Tennessee State University (MTSU). He has taught Industrial and Organizational Psychology at National Taiwan University and at MTSU. Professor Tang teaches, has taught, MBA/EMBA courses in China (Hong Kong and Shanghai), France (Nantes), and Spain (Valencia). He serves, has served, on 6 editorial review boards and reviews papers for 28 journals. His research interests focus upon compensation, the Love of Money, business ethics, pay satisfaction, and cross-cultural issues. He has published more than 100 journal articles in top behavior sciences and management journals (e.g., Journal of Applied Psychology, Personnel Psychology, Human Relations, Journal of Management, Management Research, Management and Organization Review, Journal of Organizational Behavior, and Journal of Business Ethics.) and presented more than 190 papers in professional conferences and invited seminars. He was the winner of two Outstanding Research Awards (1991,1999) and Distinguished International Service Award (1999) at Middle Tennessee State University. He also received the Best Reviewer Awards from the International Management Division of the Academy of Management in Seattle, WA (2003) and in Philadelphia, PA (2007). Yuh-Jia Chen (Ph.D., Columbia University) is an Associate Professor of Business Statistics in the Rinker of School of Business at Palm Beach Atlantic University, West Palm Beach, FL 33416. He has taught statistics at Middle Tennessee State University and Teachers College, Columbia University. His research interests lie in money attitude, choice and decision-making, risk-taking behavior, and compensation. His publications have appeared in behavior sciences and management journals (e.g., Journal of Behavioral Decision Making, Journal of Business and Psychology, and Journal of Business Ethics). for their encouragement, Dean E. James Burton, the late Fr. Wiatt Funk, Fr. John B. C. O’Neill, Toto Sutarso, and Larry Howard for their suggestions, Bishop David Choby, Fr. James Kallarackan, Robert Dray, and Richard Leggatt for their encouragement, and Janice Reeves, Sally Govan, and James Van Buren for their assistance. 1.Department of Management and Marketing, College Of BusinessMiddle Tennessee State UniversityMurfreesboroU.S.A. 2.Rinker School of BusinessPalm Beach Atlantic UniversityWest Palm BeachU.S.A.